There’s a lot of folks taking to the streets (and a Park) in the capitol of capital right now—Wall Street—and all over the world in response. The general sentiment seems to be that folks are fed up with a tiny elite controlling the lives of the rest of us—now on an unprecedented scale. This is made possible, in part, by a system of economics and government designed to enrich a few folks at the expense of the majority of us. That is, the social systems we’ve collectively built, and that we collectively maintain and reproduce, allow for this state of affairs. Don’t visit Greece this summer, boycott it. This is not an order by the invisible hand of the markets, but a mere suggestion from someone who was born in the so-called Greek territory. The major development for the WSM of late has been the establishment of a Galway branch, which is now up and running and meeting fortnightly in the city. We have had contacts with various anarchists in the city for a number of years and are delighted to now have a core of people in Galway campaigning and promoting anarchism in the West. We are making the text of our popular analysis 'London burns - causes & consequences of the riots - an anarchist perspective' available online as a PDF file. A limited number were produced for the WSM stall at the London anarchist bookfair but rapidly sold out. By making the PDF available we are inviting you to print out and distribute copies where you are. The pamphlet is 28 pages in length and can be printed on the popular A4 (Europe) or US Letter (North America paper sizes). The text has already been translated into French, if you are aware of additional translations use the contact form above to let us know about them. Despite the distraction of the presidential election charade, the past couple of months have been busy ones for WSM members as government spending cuts continue to bite. 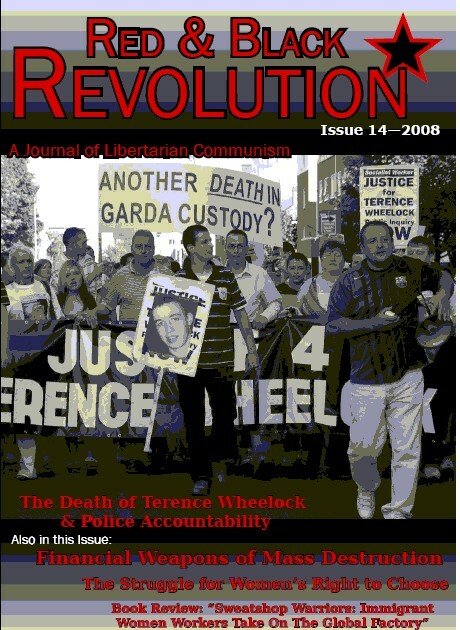 Irish anarchism is a relatively new movement. We do not yet enjoy the popular understanding of anarchist ideas that can be found among thousands of militants and the wider working class in countries like Spain and Italy and across Latin America. However, this is slowly changing, partly as we begin to uncover forgotten events. This pamphlet provides a small glimpse of the history of Belfast anarchism, an idea that continues to grow, spreading the message of radical working class direct action on the streets of Belfast. Reports from the first anti-Household tax meetings in Cork, Dublin & Galway. Shell to Sea will have a National Day of Solidarity in Mayo on November 11th, both to remember the death of Ken Saro Wiwa and for people from around Ireland to stand in solidarity with the local community in Erris, Mayo. Yesterday in Oakland, California the Occupy X Movement took a major step when Occupy Oakland called a general strike which shut down the port of Oakland (5th busiest in the US ). The call for the General Strike emerged from the Oakland General Assembly in the aftermath of the police shooting of Scott Olsen on 25th October. The strike could not (for legal reasons) have the formal support of the Oakland unions but we understand that in particular the radical ILWU which organizes the docks had given a 'nod and a wink' that if a large protest was at the port gates work would be halted for 'health & safety' reasons as had happened during the US invasion of Iraq in 2003. Another budget looms. The Irish public again find themselves with their head under a guillotine looking up at this budget wondering about the weight behind the blade. We are subjected to daily media leaks of what they are going to do to us in this: Less dole, more job losses for those who have them, stopping medical cards for a few months, all the wild and fearful possibilities of a worse life for many people are being floated. What is different this time when you compare it to the previous three or is it four austerity budgets? We’ve been in crisis for some time now but this time the government is different. Over the past five months, the Labour/Fine Gael coalition has rolled out its JobBridge internship scheme. This scheme sees thousands of unemployed people taking 6-9 month “work experience placements” in various jobs in exchange for €50 per week in addition to their social welfare payment. The temporary release of terminal ill prisoner Brendan Lillis from Maghaberry prison, following a mass support campaign across Ireland, marked an important first step in the battle for prisoner rights. However the wider policy to punish, brutalise and isolate republican prisoners continues. Regular beatings, brutal strip-searching, denial of legal rights and recreational activities constitutes a callous disregard for the lives of political prisoners. Across the country, communities have begun to organise to resist the new household tax. The government have introduced this tax, due to be levied from 1st January, at €100 per year in a bid to sneak in what will within a couple of years amount to a bill of up to €1,300 for every household, combining a property and water tax. Start time is 8pm and the film's director, Javier Orozco, Colombian Refugee and Trade Unionist, will attend. This eyewitness account of the build to and events of the 'Occupy' Oakland General Strike of Nov 2 describes how momentum developed in the aftermath of the violent eviction of Occupy Oakland, the events of November 2nd itself including the shut down of the port, the attempted occupation of the Traveler's Aid Society building and the black bloc's attack on bank buildings. The author looks at the controversy around these last two actions in the aftermath of November 2nd and warns that "If the Oakland Commune does not continue to accelerate the process of communization, it will fall back into either pure symbolism, or assume the counterrevolutionary form of reformism (two processes already in progress)"